» Is Skimping On eDM Design The Problem? Mobilize Mail > Is Skimping On eDM Design The Problem? Is Skimping On eDM Design The Problem? Posted on Friday, June 6th, 2014. How are your eDMs performing? Are you happy with the open and click statistics? They could be better – right? And they can be by focusing on the design. It wasn’t that long ago your business was handsomely rewarded for just delivering a regular e-newsletter – design really wasn’t a priority. As long as the e-newsletter had good content and a couple of links back to the business website it’s email recipients were happy to take action. Not so today – design is almost everything! Business email communication has moved on and eDM design is now as important as the content. A poorly designed eDM will be canned by its recipients even if the content is up to its usual high standard. Why Is eDM Design As Important As The Content? Mobile Device use for ‘all things online’ including email is breaking records and eDMs have to be designed for these devices. (see this infograph on the golden age of the mobile). Volume of daily eDMs is growing – therefore your recipients are receiving more emails and your business eDMs are completing with more emails for attention. With only seconds to impress in the Inbox – is the design of your business eDMs affecting your campaign statistics? Probably. Every eDM can be improved, they are essentially a work in progress. A good starting point is to review your email template. 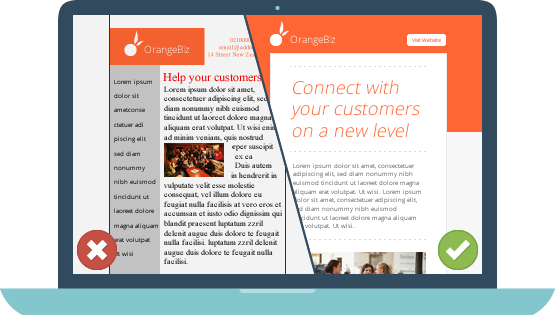 Ideally your templates are now using responsive design as well as a good mix of colour and quality images. Invest in the design of your eDMs and observe the improvement in your email marketing statistics. More opens and clicks off your email marketing campaigns can lead to more sales enquires and the opportunity to interact regularly with your clients, referrers and prospective customers.